When students teach and encourage each other, it helps them remember what they've learned and enjoy the process of learning more because it's a social process. With piano it's particularly useful because everyone has a different way of remembering what to play, a different style, and different ideas for composing and improvising. This means that when you learn with PianoEasy you develop a unique style that's influenced by everyone you're learning with, whereas if you learned one-on-one you'd develop a very similar style to your teacher. The other reason it's important to learn piano in a group setting is because it's meant to be played in a group setting! Music is something to be shared, so there's no point learning it alone if it's not meant to be played alone. 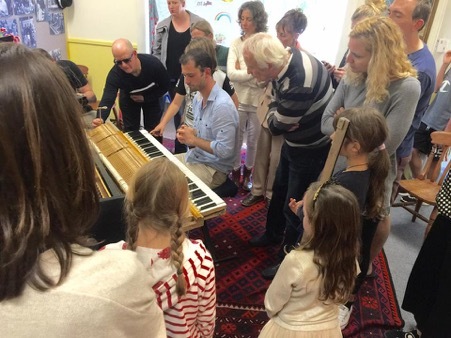 Learning in a group means that from the very beginning you're accustomed to playing in front of people, which makes it easier to perform in front of a crowd later on, and you can enjoy making music and singing along with your friends and family.